I met a lot of good in the view of the ponds and thought, “That would be where to fish!” But alas, the fish were very small. These reservoirs in the winter, hypoxic. The usual natural causes of Zamora — the decay of dead aquatic plants and animals. Rot and a ton of autumn leaves from the surrounding trees. From the water absorbed by oxygen and releases harmful gases from the sludge. The fish suffocate. In some cases, fish die from the pollution by waste waters, as well as from entering the reservoir of the swamp water, squeeze out the cold marshes. In ponds with deep pools sometimes sets in very quickly Zamora. Apparently, these pits have a message from the anoxic subsurface flows, at times hard flowing into the reservoir. In reservoirs in winter lowered! water to accumulate and flood the weakening of his actions. 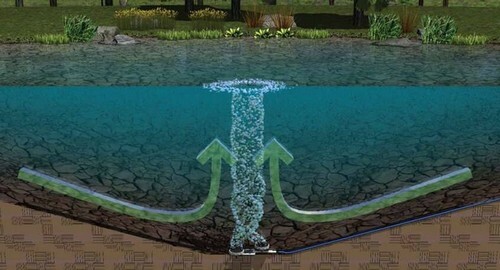 The lower level reduces the pressure of the water and sludge begin rapidly released gases, saturating the water so that it becomes harmful to fish. During the descent of water ice falls to the bottom and out of the muck silt — rich extract products of decay. Draining from the ice with a large area of the bottom, a slush in the abundance raspushennoy falls into the water and riverbed of the rivers at the bottom of the reservoir, causing the death of many fish. The decomposition of the sludge occurs in the summer, but with an open water surface the oxygen content in the pond is restored and even increased due to the allocation of water plants. Harmful gases into the atmosphere. And in the winter ice cover and lack of plants prevent entry of oxygen into the water. The harmful gases accumulate. The only source of replenishment of oxygen in some reservoirs are inflows: rivers, streams, springs. Often, however, the tributaries are contaminated, obeskislorozhennuju and even poisonous water. In stagnant water, the lack of sources of oxygen often leads to Zamora. Survive only carp, verkhovka, and that not all bodies of water. But in such places can be driven a lot of good fish, and fishing in them would be great if every winter to aeration of water. A few years ago began Zamora in the pond vacation homes in Raven. Have drilled a lot of holes, but Zamora continued. Many fish swam in the holes on the side and the top. But when I put screw the aerators, the pestilence quickly stopped. Since then, work here in winter aerators and Zamora does not happen. LOSINOOSTROVSKY hunting in the ponds for recreational fishing the fish are killed by suffocation. Did not help any water from artskvazhiny or air supply compressor. Installed two screw aerator and Zamora stopped. Pike in ponds reached 5-6 kg. The same aerators prevent fish kills in ponds hunting in Lotoshino, in a big pond hunting in Malinniki, in the Annunciation Zaton. In the pond city Star in the first winter began Zamora, fish accumulate in the hole. And after 2-3 hours of aerator fish kill was prevented. And for several winters in ponds Star Zamora is not the case, recreational fishing is not spoiled. Interestingly, due to the aeration of water in ponds peck Star in winter silver carp and even carp. The reason is that there is used a method of aeration near the bottom, warmer water layers. The high content of oxygen, favorable temperature and presence of food at the bottom evoke the fish’s appetite. Aeration may be that’s what important. Usually fish are kept dispersed in water, and their flocks and then move. Because of this, anglers catch very few fish, especially where there is a reduction in fish stocks. Creating winter in the waters of the zone with a high content of oxygen, it is possible to concentrate the fish in them and greatly increase the efficiency of fishing. Of course, with appropriate controls, which are easier to implement when fishermen settled on a relatively small area — the area of the freshened water: here they mean everything. Concern that the concentration of fish in the aerated zone would entail over-fishing, unjustly. Many fishing camps are organized at very small ponds, where, apparently, it is very easy to catch all the fish. However, with proper use of the reservoir occurs. Despite the fact that, no, an angler does not go away after fishing without a good catch in the pond is still a lot of fish catches and sells base, thereby increasing their income. This fishery was first carried out by some groups, WOO. The improvement of the economy of these databases — fish farms — allowing them to build new ponds and to grow your fish seed for the annual restocking. In the language of the farmers, such a database becomes full-cycle, that is, provide themselves with their fish stocking material. According to the existing technological requirements full-cycle pond farm must be equipped with flow-through ponds. However, the experience of Moscow and fish-farming reclamation plant has proved that the aeration allows you to create full-cycle farms on a completely stagnant ponds. Thus, the aeration of water can help the groups of fishermen to create pond management for recreational fishing. Not only in winter but in summer useful aeration. And sometimes it is absolutely necessary, especially in those waters, where deep-water depressions of the bottom are formed stagnant water with constant Zamora. In reservoirs, a bloom of blue-green harmful for the fish with algae, aeration does not develop these plants and improve the habitat for fish. Especially need aeration in the water bodies in the catchment will inevitably get contaminated runoff. Aeration is very important in floodplain lakes, in which after the flood and spawning river fish is a lot of juvenile fish. In these lakes the most part shallow, heavily overgrown, and in the winter, hypoxic. They annually kill millions of young fish. The salvation of juveniles by harvesting and transplantation nezametnye in reservoirs or by water draining from the lake into the river is technically difficult and is associated with high material costs. To aerate the water in the lakes is much easier, cheaper and more efficient. Quite one or two of aeration of the water all winter, so all of the fish survived to the disintegration of the ice. Examples proving the benefit of aeration of the water, there are many more. It is used most of fish farms and hatcheries, but, in my opinion, aeration is the power of societies and anglers, unless of course they together take up the case. Something to aerate the water? The widespread belief about the benefits of hole — annoying error. Because a thin layer of water in the hole in contact with the air, cools, and becomes easier the underlying layers of water. Neither in the depth nor in the part of the layer of the hole does not go away. Diffusion of oxygen is only possible by diffusion, i.e. due to the motion of molecules. But the process is so slow that there is no practical value has no. Besides, the surface layer of water freezes very quickly. Sinking in the hole sheaves of straw slows down the freezing no more than 1 -2 hours. At straws the air into the water held can not — they are in fact a lot of partitions. Therefore, passive “aeration” hole is absolutely useless. A more efficient aeration of water and large volumes mechanically pumped under the ice of the pond. There are two basic methods of aeration: either spraying water in the air or spray it in her. In the first case, water is pumped by the pump from one hole to another by splashing in the fall on a platform of boards with straps or pass the stream through tier wooden grilles (cooling tower). Also used a paddle wheel and a boat propeller. In the case of the wheel-motor it is necessary that the exhaust gases do not come out into the water, and higher than its level in the icy groove. The most simple aerator paddle wheel with pedals from the iron bars. Set in the icy groove so that the blade is in the lowest position was 2/3 of the width immersed in water and is held 1-2 cm above the bottom of the ice groove. The pedals are placed in a wooden fork pegs, frozen in ice on the sides of the groove. Relying on catching on blesny and pressing alternately on the pedal foot, two rapidly rotating wheel. When groove width 80 cm and depth 10 cm wheel creates a water flow of about 20 l/h, that is, in the reservoir flows up to 70 m3 of aerated water per hour. 7 hours of work this aerator provides a reservoir of about 500 m3 of fresh water, which, spreading in layer of 20 cm, forms a zone of 0.25 ha. To quickly not be tired, you have to press the pedal alternately right and left foot. You can rotate the wheel catching on blesny-handles, wearing the pedal wire loops at the ends of the catching on blesny and alternately pushing and pulling the dirty pole arms. Alternating the techniques of wheel speed, avoid quick fatigue. This aerator can be made in half a day, and the installation will require even less time. In case of an emergency, you can temporarily use the car, but only when the ice thickness not less than 60 cm To the rear wheels of the car to attach the wooden planks 5х7х60 cm with threaded through them with thick wire (catalkoy 6 mm in diameter), under which egged wedges — for even more tension and compession straps to the wheels. The car previously raised by jacks placed under differ wooden chopping block, fasten them with brackets or wire. Rear wheel with straps should rotate freely in the icy grooves with a depth of 7 to 10 cm from the Side of a car, 2-3 m from it, both sides cut through the through holes with a diameter of 0.5 m, which grooves expel water under the wheels of a car. When the wheel rotates strap-foamed, and pushed far throw water from the grooves, where again the water flows from the through holes. Cast water a wide shower of spray falls in the big lane. In this way for 3 hours and refreshed the water in wintering pond of 0.5 ha. Prolonged operation of this aerator in one place is unacceptable. As soon as the grooves of the wheels will be deeper than 5 cm, it is necessary to move the machine to another place. At the same time it is urgent to prepare other means of aeration and release the car. To aerate the water by spraying using a special sled with limescale moving around with ice grooves. The sled is attached to the long end of the pole is connected to a Bush wheel mounted on the axle vertically frozen. The short inboard end of the pole podpravit horse. As it moves in a circle slide quickly sweep through the grooves in the ice, foaming water limescale and shoving it in the hole grooves-branches. At the same time the slide pushes water ahead of itself, causing it to sparkle with shafts of spray through scalloped edges lemeshow. This horse aerator design Dobrynin good aerium water in the grooves, but forms a narrow refreshment areas under the ice. Therefore the aerator should be moved to other locations of the reservoir. All methods of water aeration by spraying easier technically feasible, but they do not provide complete saturation of water with oxygen. The reason is that the water spray flying in the air for no longer than 1-2 seconds. During this time saturated with oxygen only a very thin outside layer of the spray, and the rest of their volume is aerated. The larger the flying spray, the less the total area of the surface and volume of the fresh water layer. Therefore, it is necessary to spray water in tiny drops. However, even with the drop diameter 1 mm, oxygen saturation does not rise above 70%. Another method of aeration of water spraying it in the air — more saturates the water with oxygen, as bubbles moving in water, creating a new surface of contact with her. In the swirling and vortex motion of the water, air bubbles do not immediately float to the surface, the time of their contact with water increases the degree of aeration is increased. But the use of the compressor leads to a drastic cooling of air and aerated water. The fact is that when you compress air in the compressor is heated. This thermal energy is inevitably consumed for heating of cold metal parts of the compressor and hoses. And when the bubbles of compressed air out into the water, they expand and highly cooled (in this physical phenomenon is based the action of the refrigerators). Air bubbles cooled the water, which in this case POPs up, reaching the ice surface or lane, which contributes to the vertical motion of the bubbles. The fish are compelled to emerge at the top, very cold layers of water, where it ceases to feed, and therefore bite. Aeration ice layer is refreshed, the water is returned into the ice and partly is again tightened into the chute of the aerator. Therefore, the aerator a smaller amount of refreshing ice water. Some designers believe that if a jet of ice water downward to the bottom, it will freshen up the lower layers. In reality this does not work. Subglacial water penetrates into the depth only in a small area — under the action of acceleration with a screw or the pressure from the pump. But losing kinetic energy, light ice water goes up at a close distance from the aerator. Can’t refresh the deeper layers of water and the aerator, which drag the surface layers. If tightening the water through the pipe or hose from the lower layers, after aeration the water is warm enough, heavy and will fall to the level corresponding to its density. Washing the parts of the bottom at this level, aerated water for fish creates good conditions respiration, temperature, power and thus cool. In addition, aeration of the lower layers allows you to refresh the significantly large volumes of water. Tightening layer with a temperature of + 4°, aerator cools it to +3,5.° This water is in the reservoir above the level at which it was before aeration. Thus, the aerator is like pumping the water layer to a new location and refreshes all of the new volumes of water until you processed the entire layer with a temperature of +4°. Place this layer down the layer with a temperature of 3.5°. Then the aerator will begin to pump this layer to level with a temperature of +3°. Each layer extends horizontally across the reservoir and has such a large amount that his pump aerator enough for the whole winter. Therefore strong water cooling will not occur. Thus, we should strive to freshen up the lower layers of water. An exception may be the case when Zamora has forced the fish to leave the bottom layers and climb in the ice layer. Then I will have to refresh, as the fish will not find fallen down aerated water. For tightening the lower layers of water to the gutter attached a wide hose or a canvas sleeve with metal rings or wooden four-sided tube of thin planks. Thus the chute need to flow the water from the lower layers. The chute is placed the aerator. If you work with pumps, the hose is directed through the chute so that the water foamed and rushed into the lane. The chute allows much longer run time on one place, and the ice grooves are washed out. Warm water in the lower layers of highly eroding ice, forming a vast lane. Edge washed ice is very thin, and therefore, it is necessary to put around the lane fence with warning labels. If the aerator is to use the internal combustion engine, then you need to be extremely careful and attentive, to ensure that water did not get even drops of fuel and lubricants. Otherwise a thin film on water will bring to naught all the work of aeration. Better to use electric motors. I designed the design of the aerator combined both methods of aeration: screw sprays water in the air, and a fan to blow air into the zone of rotation of the screw. This ensures good saturation of water with oxygen and “blowing” her from harmful gases. The fan does not generate a large air pressure and cools the water slightly. Aerator design is very simple. The motor (1.5-2 kW, 1400 rpm) and the screw is connected to the shaft-pipe on two bearings. To the shaft-tube attached to a fan. All this is mounted on a frame of angle iron. The aerator is installed in an inclined wooden trough, so that the screw was submerged, and the fan and motor were on it. Together with the rotating shaft, the fan pushes air into the funnel, where through a series of holes in the walls of the pipe, the air rushes in and goes into the water through a small hole near the screw. The water jets increase the flow of air into it, tightening it like a water jet pump. Coming out of the shaft-pipe, air bubbles get under the rapidly rotating screw and well mixed with water, forming a rich foam. Then aerated water rushes through the gutter and flows into the lane. The place of water, driven away by the screw into the chute continuously flows in a vertical pipe the water from the lower layers. The chute is fixed on slikah driven into the bottom. Comfortable strengthen thick wire (catalkoy), threaded under the flume and mounted on slikah. The dip of the trough to regulate the tension of the wire, ensuring the highest foaming water screw. Side gutters shall be 5 -10 cm to protrude out of the water. For security screw it is necessary to protect the casing of roofing iron. To approach the aerator make a bridge gantry or piles. The cord should hang on high poles with a fork at the end, and with inscriptions prohibiting to touch the wire. It is helpful to provide motor thermal protection. In the gutter in front of the aerator insert metal bars that screw not tightened the fish branch. The place for installation of the aerator are selected so that fish could be detected faster refreshed the water. It should be directed at smaller depths. On the square, the intended area should not be obstacles to the distribution of the refreshed water and approach fish: shoals, Islands, barriers, bushes. It stops the aerator should not versati. To do this, lift the end so the screw came out of the water, and fixed in this position, tucked under the frame and stick leaning on the side of the chute. Before lowering the aerator into the chute, you must remove the ice in place of immersion of the screw. Depending on local conditions, the size of the aerator can be somewhat different, but very large, heavy motors uncomfortable. Experience aeration in the Annunciation backwater of the river Klyazma proved the possibility of using a small aerator with a single-phase motor power 0.5 kW and 1400 rpm. the screw Diameter of this aerator 100 — 120 mm, shaft diameter-tube 25-30 mm (in) and length of 0.8-1 m. This aerator drives through a chute about 10 l/sec, i.e. 30 m3 fresh water per hour. In 7 hours he creates a refreshed area to 0.2 ha. In continuous operation of the aerator was maintained throughout the winter an area of about 1 ha and open a lane width 4-5 m, length 10 to 12 m. with this in vossegaten Zaton Zamora was not. The size of refreshed area depends on the amount of aerated water, the intensity of Zamora and the configuration of the reservoir. As the spreading of the fresh water reservoir, the oxygen content in it decreases. The more incoming aerated water, the faster it spreads and time to move on from the aerator, while maintaining good quality. But the more intense the pestilence, the faster the water deteriorates refreshed and minimum limit of oxygen may be closer to the aerator. The farther away the rate of spreading of the refreshed water is slowed down, the amount of oxygen decreases and at some distance the water loses overinvest. This distance — the radius of the aerator is roughly counted by the amount of incoming water, spreading a layer of 20 cm for 10 days. The boundaries of the zone are specified analyses of the oxygen content in the water. For analysis I designed a comparator. It allows you 2-3 minutes to determine the content of oxygen in the water and to work directly on the pond. Samples should be taken every 20 cm of the water column in order not to miss the aerated layer. Aerator with a motor power of 2 kW, with screw 200-250 mm3 yields up to 50 l/h, or 180 m3 of aerated water per hour. 7 hours in the pond goes up to 1200 m and in the spreading layer at 20 cm formed area of 0.6 ha. In this area can be saved with a fish pond of 10 hectares. by daily operation of the aerator area can reach the size of 2-3 hectares for 2 weeks. Checking the oxygen content or continue aeration if it is low (3-4 ml/l), or temporarily stop, when the oxygen content in most parts of the zone of 6-7 ml/l. The elongated shape of the reservoir and its bottom roughness also affect the size of the aerated zone. On a flat, horizontal bottom refreshed the water spreads evenly in all directions, forming a circular area. Depression and rakoobraznye grooves on the bottom are filled with aerated water, and mostly on them, the water spread. Form area then get elongated and tortuous. For even a slow dramatically changes the shape and size of the zone. All this must be considered when deciding on the number of diffusers and their placement in the pond. There is no need to refresh the whole pond; it is sufficient if 10 hectares of its area to cool off will be 1 ha. If you do not want continuous work in one place, the aerator can be moved to another trough, working alternately. Single phase aerators operating from the normal lighting network and consuming no more energy electric, can be widely applied to eliminate Zamora in many local waters. This is a very important and environmentally. Many people think that viviparous fishes are found somewhere far away, in tropical waters, but these fish only aquariums. However, the situation is far not so. Viviparous fish are in the ponds of our country, though they are not so little. Each of us is probably familiar with grouper. This — viviparous fish. It is found in the Pacific, Atlantic oceans, the Barents sea, occasionally found in the White sea, living at depths up to 1000 m, sometimes reaches 80 cm in length. The female redfish in one season can produce up to 360 000 fry. However, displace other fish sea bass: the nature of “allowed” him to reproduce only after reaching the age of ten, and among fishes it is almost old age. In the waters of the South of our country brought Gambusia is a native of North and Central America. She charged a good “position” to destroy the canals and rice checks mosquito larvae, to help people in the fight against malaria. It is a small fish — the female grows no longer than 3.5 cm, and the male is 6 cm, and she gives birth to only a few dozen fry. And yet Gambusia propagated quite quickly. The fact that this precocious fish — it begins to multiply at the age of less than a year. Baikal is the only place in the world where to catch a golomyanka. She is naked, no scales, the body is pale pink, the length of the female 23 cm, males up to 15 cm Golomyanka lives in the water column, but sometimes it can be found at depths up to 750 m. the Golomyanka is fighting for the continuation of the species from along two lines: first, give birth to up to 5,000 fingerlings; second, to 90% in this species females. And yet it is not so much: during reproduction, a significant portion of fish are killed. In the Barents, White and Baltic seas is home to Beluga, very similar to burbot. It nebolisa fish only rarely up to 40 cm Beluga — coastal fish, it is rarely found deeper than 30 m. it is Interesting that although she would give birth to fully formed fry, but they are so transparent, that with a magnifying glass you can see their flowing blood. At one time it produces up to 400 “heirs”; to continue the race, it helps that at low tide they can remain among wet stones and a hole inaccessible to the enemies. Many among viviparous sharks. This, for example, porbeagle, which is found in the North Atlantic, occurs in the Barents sea. It reaches a length of 3.6 meters and weight — 300 kg porbeagle brings no more than 5 cubs, but whatever — sometimes up to 70 cm in length. A little? Yes, very, very small, but they are born fully formed. Viviparous fish well known to aquarists. It guppies, Polynesia, platypus and others. There are even rare among the cave fish living in perpetual darkness underground reservoirs and therefore completely lost not only color, but also the vision. How to explain such a phenomenon? Podavlyayushee most species of fish lays an enormous number of eggs. For example, pike up to 1000 000, carp to 1 500 000, Beluga is about 8 000 000, cod — 10 000 000, and a fish or even 300 000 000 eggs. A huge number of them are killed — remains unfertilized, obsahem on the banks after the sharp recession of the water, eggs are eaten by other fish and even those who swept. Fertility almost all viviparous fish is negligible. Thus, if they were vymenivali the eggs, then died out long ago, however, the survival rate of offspring is very high. Therefore, scientists consider live birth as a form of care for offspring.